ascend in the rain foest from Machame. The path is often heavily eroded. ascend in the Erica arborea zone. 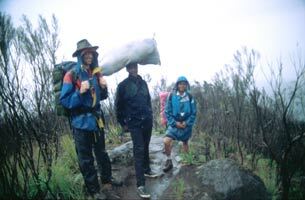 Our guide August and his porter Yussuph with the load on his head. We carried our gear by ourselves, but the usual way on the back. from the Shira Plateau to Arrow Camp. 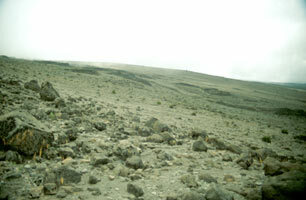 No more vegetation, except for lichens on the bizarre lava formations. 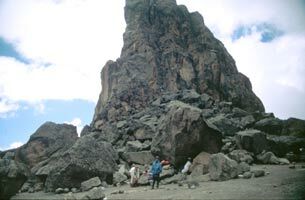 Lava Tower: 4600m. A short rest before the ascend to the Arrow Camp at 4900m. Arrow Camp. To save weight, we did not carry a tent but just a large plastic foil. It worked very well, even during the snowfall that night. Furtwangen Glacier in the sunrise. We are now in the middle of the last 150 m ascend to the summit. View from the summit to the Western Breach and Furtwangen Glacier, where the first ascend ended. In the back one can see the Northern Ice Field. 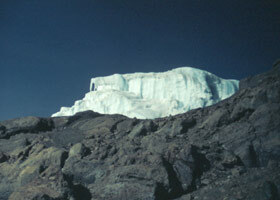 In front of the Southern Ice Field, almost at the summit. The steep descent on Mweka Route back to the Erica arborea zone (seen as the green band near the fog on the far right side). 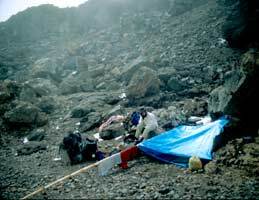 Mweka Camp in the Erica arborea zone at about 2800m. A nice view of the mountain. Our guide and his porter are ready for the last descend. 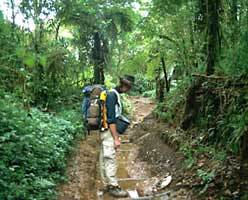 The last steep descend through the rain forest. 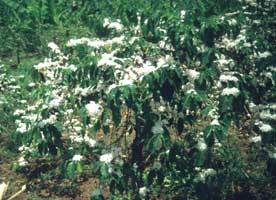 Around the mountain villages there are banana plantations with coffee (under the banana trees). 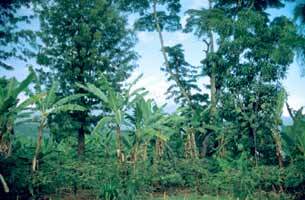 The tall Grewillea trees give shade to the banana and coffee plants and are used as construction wood. 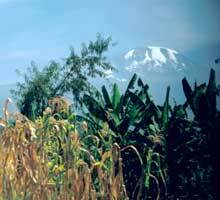 Corn and banana plants near the village Machame. 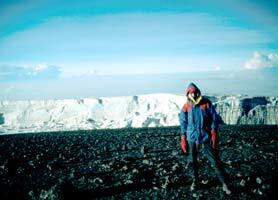 Kilimanjaro summit in the background. 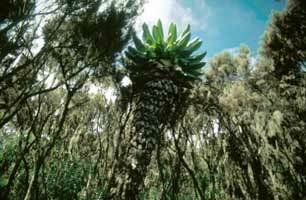 Following the agricultural zone, the rain forest on the Machame side consists mainly of Ocotea usambariensis (Campher), Agauria salicifolia, and Macaranga kilimanjarica. 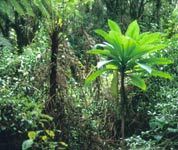 In the lower regions of the rain forest there are tree ferns, and also Lobelia gibberoa. 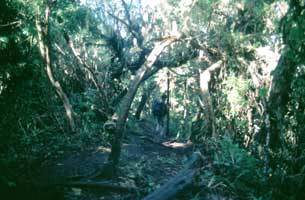 On the Mweka route there is also Podocarpus latifolius, Rapanea melanophloeos, and Croton macrostachys. 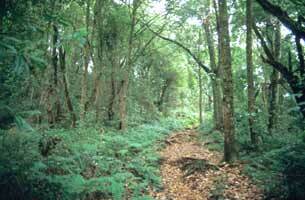 The rain forest stops at about 3000m. 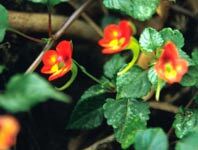 Lobelia gibberoa next to a tree fern. The Erica arborea zone: A diverse number of shrubs from the Ericaceae and Proteaceae families, often covered with lichens. 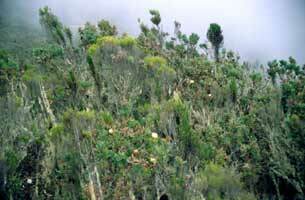 The giant Senecio among Erica arborea.This zone of bushy shrub vegetation dominated by Erica arborea goes to an altitude of about 3600 m.
Lobelia deckenii. 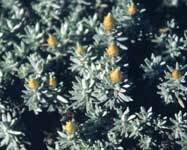 It grows in the alpine region following the Erica arborea zone. 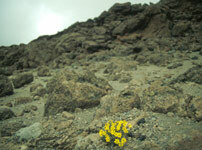 We found this flowering one near the Shira Camp at about 3700m.The alpine region is dominated by small shrubs, mainly Asteraceae. This region goes up to 4300m. 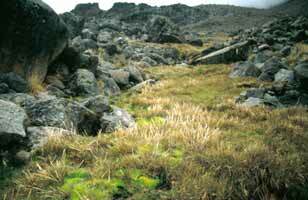 In this alpine region between 4300m and 4700m, only grasses, and mosses can be found. We found our last supply of water in this moist valley among lava rocks. The last flower, a yellow Asteraceae. The rocks are then covered with lichens, especially on the sides which are exposed to fog. 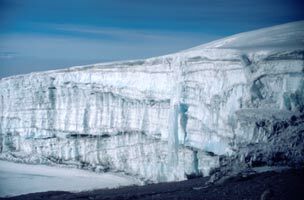 Above 4670 m there is mainly ice and bare rocks. 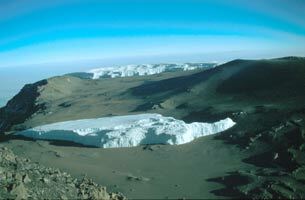 The upper end of the Southern Ice Field near Uhuru Peak. 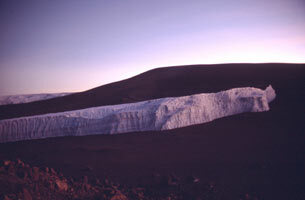 The glaciers of Kilimanjaro are melting rapidly. 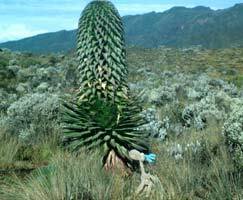 We did the tour in 3 and a half days, meaning direct ascend from Machame (1400m) to the Shira Camp (3800m) on the first day. On the second day the walk to the Arrow Camp (4900m). 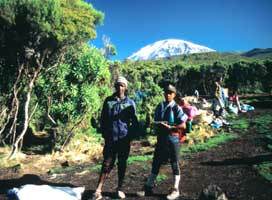 The third day started at midnight with the ascend to the summit (5895m) and was followed by a descend to the Mweka Camp (2800m). The fourth day basically was walking back to Mweka village (about 2-3 h). Copyright © 2000 Waltraud Schulze & Andy Heßberg.